There's an achievement associated to looting 20,000 of these (Magnata dos esgotos). Which awards you with Rataranhão. You can also get these from Mateus Rabis by turning in these Vela Gloriosa de Cerume. You can obtain Vela Gloriosa de Cerume from Conjurador Margoss by fishing up 25 Mana Afogado. The Olho Cego is a PvP-related currency that is earned and spent in the Dalaran sewers. It can be used for a variety of merchandise. Guards are active whenever you have the Guardas dos Esgotos debuff. However, by talking to Raethan, the less-than-savoury Underbelly Guard Captain, you can bribe him into calling back his guards and making the area a PvP free-for-all area for a short period of time. Doing so costs 50 Olho Cego. Guards are inactive whenever you have the Sem guardas. debuff. That being said, anyone can opt out of getting pummeled by random players by hiring a personal bodyguard from Raethan (he runs quite the racket!). Doing so costs 5 gold, and gives you the Guarda Contratado buff for 5 minutes*. When wandering through the sewers with your bodyguard, you cannot attack or be attacked by other players. Note that this buff cannot be cancelled manually by right-clicking. Leaving the Dalaran Sewer area prematurely will cancel the buff, however. Note that the Underbelly is the new home of the Black Market Auction House and Madame Goya. It is located in the large northeastern hexagonal room on the map of the Underbelly. There are a number of ways to acquire this currency. Although it is loosely PvP-related (as Dalaran Sewers is often a PvP area) there is no PvP strictly required to obtain it, although killing players will increase your Olho Cego earnings. The most lucrative activities require that you do not hire a bodyguard - and thus may be flagged for PvP combat. Note that you do not lose Olho Cegos when you die (either to mobs or other players); once you earn it, it stays with you. Once you loot 20,000 Olho Cegos, you obtain the achievement Magnata dos esgotos, which rewards the Rataranhão mount. This total is irrespective of when or how you spend the currency - simply looting that amount (total) will unlock the achievement (i.e. you don't need 20,000 at once!). There are various items that, when purchased for Olho Cego and used by one person, will summon numerous mobs around the sewers that anyone can engage. When killed, these mobs drop Olho Cegos (1-10 each). These mobs can be engaged even when a hired bodyguard is active. Killing other players while the Sem guardas. debuff is active will net you anywhere from 15 to 50 Olho Cegos per kill. Note that you will not receive any Olho Cegos from kills if in a raid group when doing so. There are a number of mini-bosses that spawn randomly, and drop 50-90 Olho Cego. Some of these need to be tanked, but others don't hit hard at all and don't need to be. The bosses spawn fairly frequently, and at peak times there can be sometimes more than one active (and they can spawn back-to-back) – but they only spawn when the guards are at their post (i.e. free-for-all PvP is not active). These bosses can be engaged even when a hired bodyguard is active. Note that the item Varinha de Mana Selvagem can be purchased from Dazzik "Proudmore" for 175 Olho Cegos and used on any of these bosses. This wand will increase the health of the boss by 200% and damage dealt by 50%, but will also double the number of Olho Cegos it drops (roughly 100-180). Mago Enlouquecido - A fire mage; health scales. Lasca - A large rat - by far the most commonly spawning boss mob. Has about 15.5 million health at baseline, with scaling health. Clearly a reference to Splinter, a character from Teenage Mutant Ninja Turtles! Chests will spawn throughout the Sewers, and can be looted (with a fairly long cast bar, which is longer the bigger the chest) and yield either 10 (Small Chest), 40 (Medium Chest) or 100 Olho Cegos (Large Chest) each. 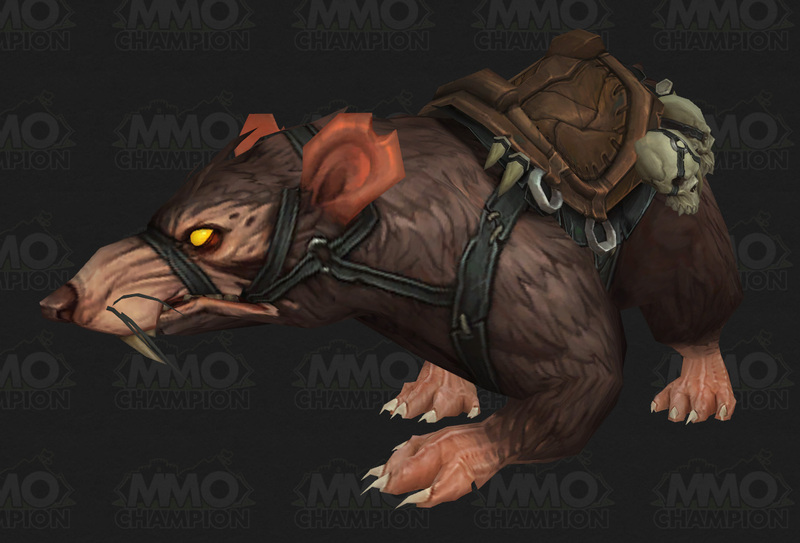 Defeating Rato Cego pets in the Underbelly in a pet battle will reward 75 Olho Cegos. Note that this pet, required for Safári nas Ilhas Partidas, only spawns in the Dalaran sewers. Pools spawn occasionally in the waters around the Black Market Auction House called Swirling Whorls, which can be fished from to directly obtain Olho Cegos. A Fishing skill of 1+ is sufficient for this. Additionally, the item Isca Vil can be purchased for 350 Olho Cego from Oxana Matademônios. Using it will spawn pools in the Black Market area, which yield Chupesgoto Inchado when fished. These contain 3-5 Olho Cegos each. Typically, fishing from Swirling Whorls directly earn you more Olho Cegos, so this item is not the best investment! Every so often a quest will appear in the Underbelly - Experimental Potion: Test Subjects Needed. These are available from Filó Espocabucho at in the Underbelly. Completing the quest grants 150 Olho Cego, plus puts a transformation buff on you that turns you into another creature (Kobold, Skrog, Dryad, etc.) and gives you some kind of new ability or passive while in the Underbelly. The buff persists outside of the Underbelly, but the special abilites only apply there. Below is a summary of the items you can purchase for Olho Cegos (from various vendors throughout the Dalaran Underbelly). It is possible to interact with and purchase from these vendors with a hired bodyguard active. A reference to the Teenage Mutant Ninja Turtles. This item will spawn 4 wild Belaruga Ninja battle-pets that can be battled and captured. Note that only 4 will spawn, and other people can engage them in combat! Aquatic Battle-pet - Jelly do Cano de Esgoto. Is cageable, and can be bought or sold on the Auction House. The next 25 people that click the crate get a Arnês do Rataranhão. Like any conjured item, this will remain in your bags until you have logged out for 15 minutes. Fishing open water in the Underbelly with Poção Experimental will yield 3-17 Olho Cego with an average of 10.09 per cast (over 45 casts, so probably not a great sample size). Given that this buff is one of six random effects from Filó Espocabucho's 'Experimental Potion' quests and only lasts for 20 minutes, it's not exactly a reliable means of acquisition, but since you'll want to do her quests any time one is available anyway, it doesn't hurt to know the benefit. Uma moeda rústica, gravada a mão. Traz um símbolo similar ao do Kirin Tor, com uma diferença fundamental: o olho está fechado.